Now more than ever, Africa appears on course to being declared free of polio. 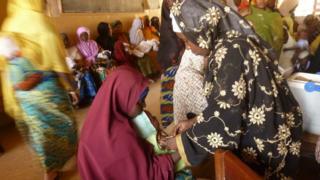 The continent has not had a case of polio reported for the last 12 months. "[It] is extremely encouraging and demonstrates real progress. However, it must also be taken within context, and with caution," said Dr Hamid Jafari, who heads the World Health Organization's (WHO) polio eradication initiative. It will be six to eight weeks before data is analysed and it is conclusively established that there have been no new cases in Africa since 11 August 2014. It is nonetheless a milestone; never before has Africa achieved this feat. But it is not yet time to celebrate. For a region to be declared polio-free, three years must lapse without a new infection. The global effort to eradicate the debilitating disease started in 1988 when an estimated 350,000 cases of polio were reported in 125 countries. Lessons learned from eradication of small pox, and the combined effort of governments and bodies such as the WHO and the UN Children's Fund, saw the number of cases drop by 99%. "Our biggest danger now is complacency. We cannot afford that local leaders or governments stop the fight now, we are too close," added Dr Jafari. "The focus remains on continuing to vaccinate children, no matter where they live, and to strengthen surveillance everywhere." Some 416 people were infected in 2013. On 24 July 2015, Nigeria completed one year without new cases of polio. Once data verification is completed, Nigeria is set to be dropped from the list of polio-endemic countries, leaving only Afghanistan and Pakistan. Insecurity in northern Nigeria - which has faced frequent attacks from militant Islamist group Boko Haram - meant vaccination teams had to improvise ways of reaching children. Nine polio vaccinators were shot dead at health centres in the region in February 2013, although no group said it carried out the attack. "Based on information from security agencies, we send a larger number of teams which can complete immunisation activities in fewer days" said Dr Tunji Funsho, the chairman of Nigeria National PolioPlus Committee for Rotary International. But still, there is no assurance that all the children in the hard-to-reach areas are safe from polio and this might just prove a major setback in the quest to eradicate the disease. "In some of the areas that are security compromised, the herd immunity is about 75% now. It's not where we wanted to be but it gives us some level of comfort that majority of the children are covered so the danger of non-immunised children being infected with polio virus is not there," added Dr Funsho. The herd immunity he mentioned is when the vaccination of a significant portion of a population provides some protection for individuals who have not developed immunity. Similar challenges have been encountered in Somalia where the al-Shabab militant group controls many remote areas. Africa's last known case of polio - an 18-month-old toddler - was reported in the northern Puntland region of Somalia. The situation in Somalia is further complicated by the nomadic lifestyle of communities. Yet, it is a country that had gone for six years without polio before an outbreak in May 2013 in the capital, Mogadishu. The outbreak sparked a countrywide vaccination campaign that saw new cases drop from 194 in 2013 to just five a year later. Somalia's experience with polio no doubt serves as a reminder that it can spread fast, but also that it can be contained. New challenges crop up in unlikely places. In the past two weeks, the Catholic Church in Kenya opposed a countrywide polio vaccination campaign, saying the vaccines needed to be tested by an independent body to ascertain their safety. The Conference of Catholic Bishops called for a boycott of the campaign saying tests were needed to check if the vaccines contained an ingredient that would cause sterilisation. The exercise, however, went on in most parts of the country and in the end the government said it had been successful. Whereas Kenya has not had a case of polio for many years, mass polio vaccination campaigns are conducted frequently over and above the recommended routine immunisation, something that partly raised the church's suspicion. The country hosts hundreds of thousands of refugees from countries with low vaccination rates, like Somalia. The next two years will be critical for Africa as it seeks to join the Americas, Europe and South-Eastern Asia in being declared polio-free.